How Long Does a Walrus Live For and Do Walruses Mate and Reproduce on Land or in the Water? Walruses usually live to a ripe old age of about 20–30 years old in the wild. Male Walruses do not usually mate until fully developed around 15 years of age, about 8 years after they reach sexual maturity. The females begin ovulating when they are about 4–6 years old, and are polyestrous. Breeding occurs from January to March, peaking in February. Walruses mate in the water. Males float patiently near the ice floes, waiting for females to make up their minds and jump in. Cue the romantic music and fade to black. Gestation for walruses lasts about 15 to 16 months, and a single calf is born. Walrus calves are born during the spring migration from April to June, weigh about 99–170 pounds at birth, and are able to swim. 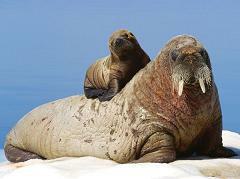 Female walruses nurse their calves for over a year, but the calves usually spend 3 to 5 years with the mothers. Walruses give birth only every two years, and the walrus has the lowest reproductive rate of any pinniped. Why do Walruses Have Such Big Tusks and What Does the Walrus Use its Whiskers For? How do Bald Eagles Mate and Reproduce and Do They Mate in Mid-Air? How Did the Bear Get its Name, What Does it Mean, And How Do Bears Mate and Reproduce?